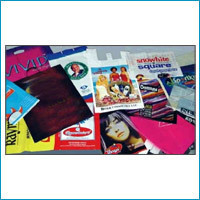 Our organization is specialized in offering an extensive gamut of LDPE Pick Up Bags. We use advanced machines in the manufacturing process so as to make sure that our products meet the international quality standards. Further, as per the diverse requirements put by our patrons, we offer these products in different colors and sizes. Capitalizing on our in-depth industry expertise, we have been offering many types of product to our client. Our range of product includes BOP resealable bags, bubble bags, courier bags, garbage bags, PVC bags, shrink film, hand stretch film, zip lock bags and plastic films in the form of roll and sheet. The wide range of our product is based on the latest technology which find wide application in commercial as well as industrial sectors. We are aimed to being ahead with our superior quality products. Our totally self-contained plant with requisite testing facilities helps us to execute our planning. Area of operation : Kolkata, West Bengal, Orissa, Jharkhand, Bihar, Assam, Chhattisgarh, M.P., U.P., Uttaranchal and Andhra Pradesh.